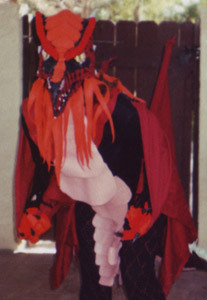 This was the first year I really concentrated on the body of the costume, rather than mainly on the mask. 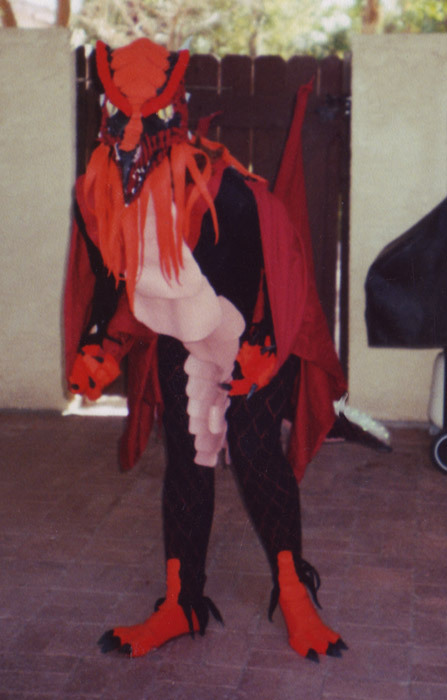 I did a lot more work keeping the entire costume consistent in colors, and covering the gaps between mask and shirt, between the shirt sleeve and hands, and between the pant legs and the feet. This one turned out very fanciful, and craft-like, rather than realistic. 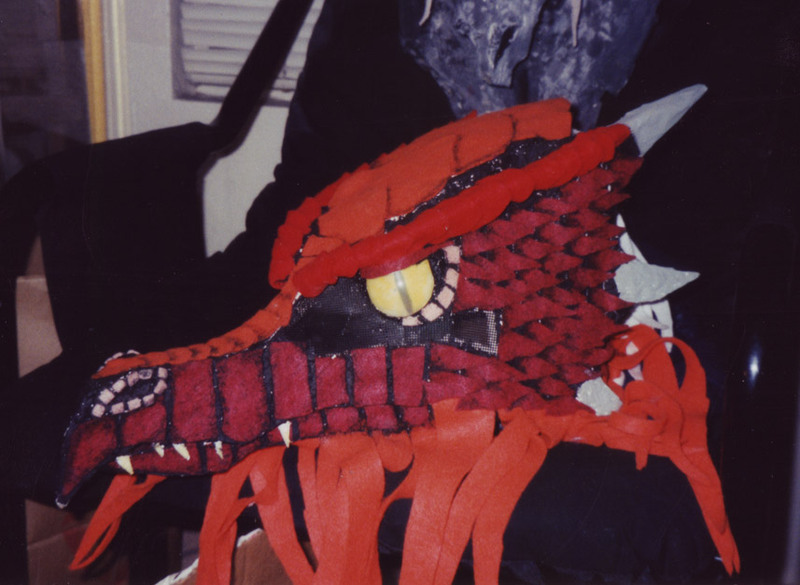 The scales and fringe on the mask, along with the belly scales and the fringe and scales on the feet, are made of felt. Even the teeth and claws are felt, hardened with glue. The white fringe down the back is Christmas garland. Both the four-fingered hands and the three-toed feet were crocheted yarn (my art teacher liked that!) 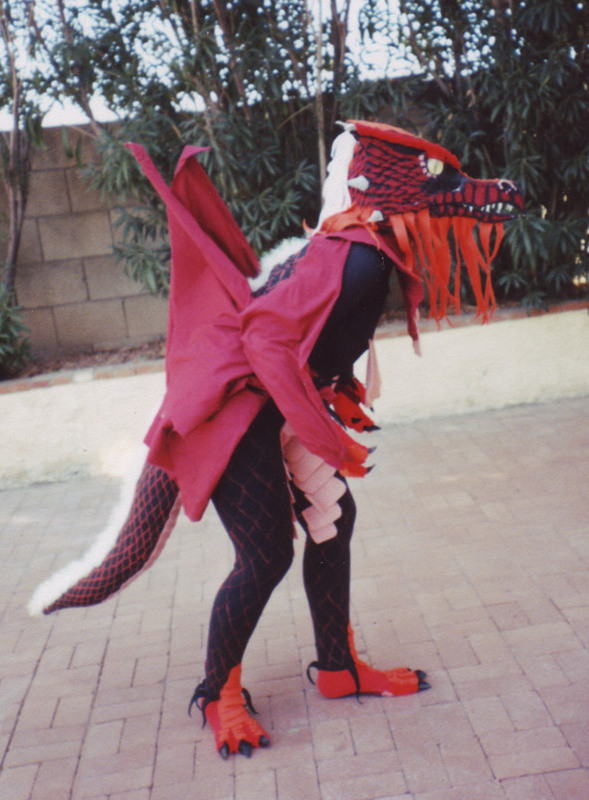 The entire costume is built off of a plain, long-sleeved black t-shirt, and a pair of black leggings, with scales painted on to the leggings and the tail. 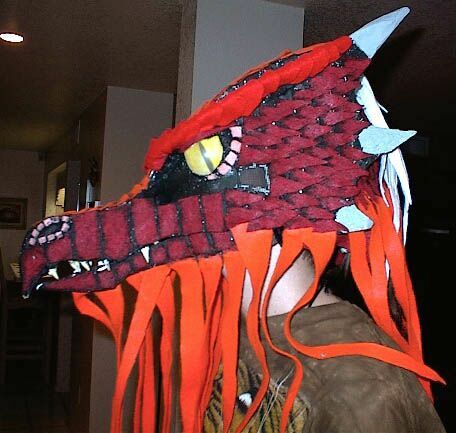 Typical of the earlier costumes I built, the mask was made from a cardboard base, built up with papier mache. 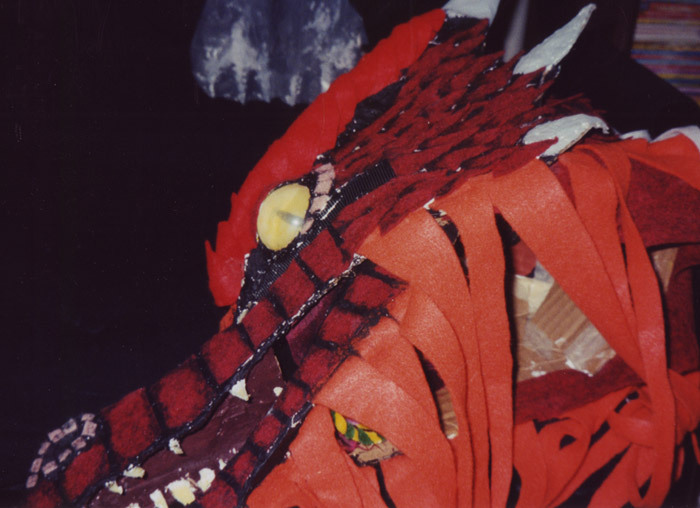 The horns are small cones of papier mache. As I mentioned earlier, the teeth are made of felt, that was soaked in glue to harden it. 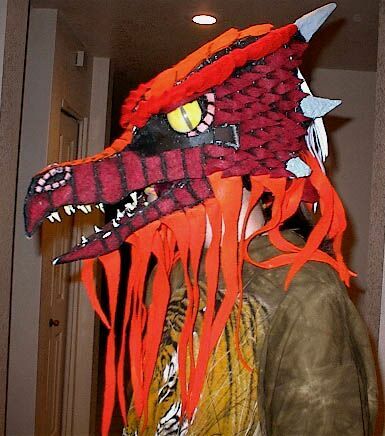 The eyes came from the remnants of my black dragon costume. 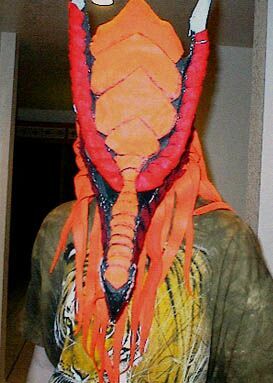 The jaw moves, hinged at the corners of the mouth with small metal rods (pipe cleaners work just as well). It was controlled by a pipe cleaner 'strap' that rested across my chin. You can see it in one of the pictures below. 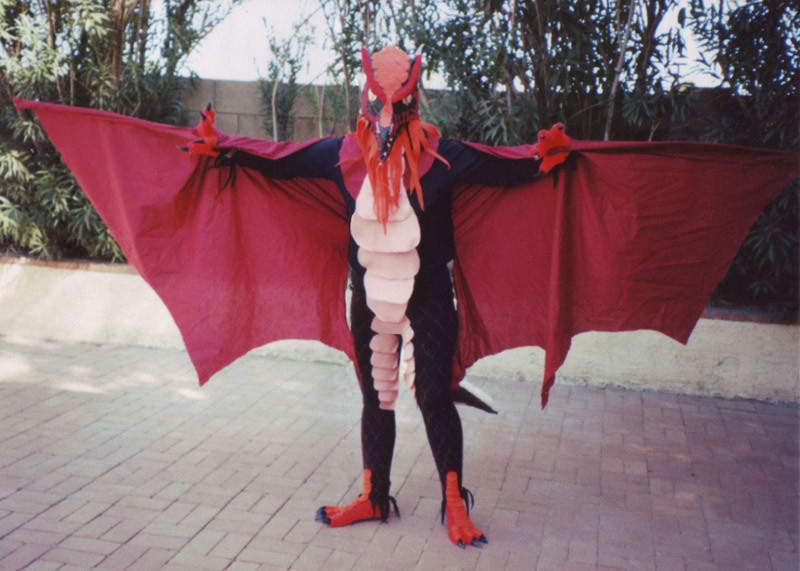 The wings came from an idea I was going to use for a bat costume that never got completed. The wings themselves were made from plain broadcloth, and were sewn to the back of the shirt. I soaked two dowels for a couple days, then was able to bend them into a slight curve, and used them to lengthen the wings about 3 feet longer than my armspan on either side — that looked pretty impressive. I could easily fold them up to my sides, as seen in the picture above, so I could walk around without smashing into things constantly. I definitely liked how this one came out; it had more of the feel of being an art project, rather than something I was striving to make terribly realistic. I might try to repeat the style in a future costume sometime. 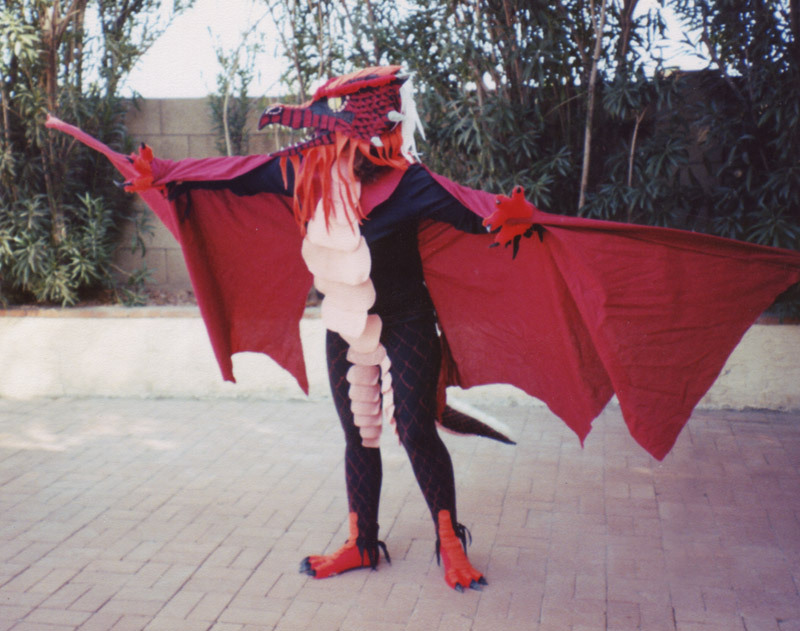 I used almost the same idea for the wings later on when I did my raven costume, Nevar.